My Brother and Sister in law came at the weekend, I made the Baked Portuguese Cod and a very easy cake/flapjack. Its so simple and very tasty and I added a little slice of strawberry to the top. Oh and a flapjack is an oatmeal bar in the UK, just in case you were wondering. It is with great pleasure to offer you all a cool giveaway. I meet Adeline a fellow Brit living in Austin Texas owner of Chocbite.com on twitter and have written a few blog posts for her site. She is lovely, and has a great concept and may I say delicious chocolate I have tasted it! 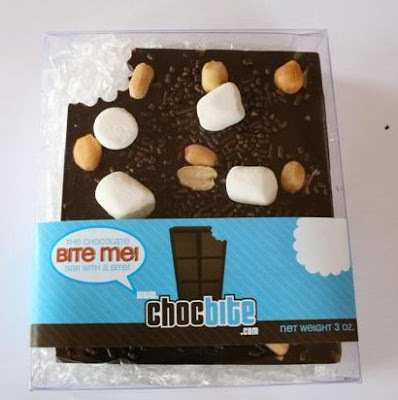 On the website you can design your own chocolate bar and it is made and shipped to you, how wonderful is that! She has kindly offered to give not just one but seven bars away all you have to do is go to Chocbite.com, have fun! and choose a bar you would like, write a comment with the bar you would like and why and who knows you could win it! There are 7 bars to giveaway!! Win yours now!! !